While I was playing an engagement in a mid-western city late last spring, a newspaper reporter called on me at the theater. 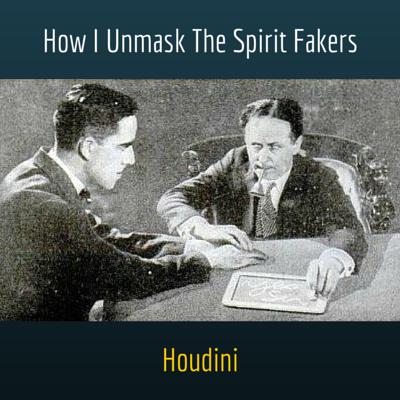 "Houdini," he said, "there's a spiritualistic medium who has been in town for more than 25 years. Would you care to come round with me and look him over?" Now, telling me that a supposed genuine medium is in the same town with me is like informing an enthusiastic fisherman that he's near a trout stream. For 35 years - during my whole career as a professional magician - I have been studying and investigating so-called, psychic phenomena - spiritualism, occultism, clairvoyance, mysticism, telepathy and similar manifestations of apparently supernatural origin. 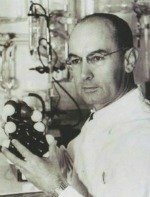 I have pursued my investigations because I have found them a fascinating kind of scientific research, not merely because seeking to explain the mysteries produced by others may seem to bear some relation to the work of one who is himself a professional mystifier. Also, the really tremendous popular interest in occult phenomena that has sprung up in recent years has stimulated me in pursuing my investigations. Every day that I appear on the stage, hundreds of people in the audience ask me question regarding spiritualism, telepathy, and kindred subjects. Every day my mail contains hundreds of questions of the same sort. The public wants to know whether there are such things as "spirits,' whether it is possible for one man by mere exercise of his will to transfer his thoughts intelligibly to the brain of another man, and so on and so on. And as a servant of the public, which every public performer undoubtedly is, I consider it my duty never to let a chance slip of obtaining authentic data on the subjects regarding which the public is looking constantly to me for information. So it was with eagerness that I accepted the reporter's suggestion that I accompany him and another man, who proved to be the county prosecutor, out to the medium's home. Now, despite any impression that may have been created by my activity in exposing fraudulent mediums, in regard to spiritualism I am not a skeptic. Although I have found no genuine physical phenomena medium, by which I mean one who does not produce his effects by purely natural means that any trained magician can duplicate, I have still an open mind. I am willing to be convinced - even to believe, if a medium can demonstrate to me that he actually possesses true psychic power. And when I went to the home of that veteran medium it was with every hope that he actually might prove capable of establishing communication with the spirits of the dead. One who had sustained his reputation for more than a quarter of a century in the same city, I reasoned, well might be assumed to be genuine. Besides, I am far too busy to waste my time "investigating" self styled mediums, who generally are believed to be frauds. Once again, though, I was disappointed. This medium was just another trickster. His "psychic power" was due to his ability as a conjurer. His methods, in short, were merely a crude adaptation of those by which professional magicians mystify audiences from the stage. He was exceedingly clever, but I had unmasked him before his séance was completed, and as a result he was arrested as a fraud. Moreover, after my exposure of this man, the police of the city began a drive against fake spiritualists, which resulted a few weeks later in rounding up 20 of these swindlers who prey upon the credulous, the grief-stricken, and the troubled. This man was what is called a "trumpet medium." The term probably requires an explanation. A trumpet medium is one who evokes the "spirits" with the aid of trumpets - cones of metal or other material that resemble the fog horns carried by the old-time sailing vessels. The trumpets ordinarily are placed on table around which the medium and those attending the séance sit in a "circle," each person clasping hands with those on his right and left. Now, the medium, being part of the circle, apparently cannot move without those who are holding his hands being aware of it. Yet, as soon as to light in the room is extinguished, queer things begin to happen. You hear "spirit voices," you feel the tapping of "spirit hands" on your head and body; odd, tapping sounds, which you are informed are the sound of "spirit feet," are heard seemingly in the air, or on to walls and ceiling. You hear sweeping sounds, too, which you are told are made by "spirit garments." Sometimes the trumpets, which are distinguishable in the darkness because of luminous rings that are placed upon them, are seen to rise from the table and apparently float about the room. To one who visits a séance for the first time, these effects are most uncanny. You are quite ready to believe that they are actually caused by "spirits." Certainly, you tell yourself, the medium, with both hands securely held, is unable to get free to talk through the trumpets, raise them in the air, or tap them on the ceiling. Well, as one who for 35 years has been freeing himself from every sort of bond, encumbrance, and restraint that human ingenuity can devise - handcuffs, ropes, chains, straight-jackets, locks, bolts, prison cells, trunks, safes, and packing cases among them - please permit me to testify that for a medium to free himself from a spiritual circle and BO get hold of the trumpet is child's play! And that's exactly how the wonders of the trumpet medium are performed. The medium gets free of the circle - or releases one hand or foot at least - and proceeds to manipulate the trumpets. Sometimes it is a confederate who permits him to escape. Sometimes, as I shall show presently, he does it through his own cleverness. The "spirit voices" that you hear are the medium's voice, disguised, issuing from a trumpet. In the darkness it is virtually impossible to trace to their source the sounds of a faint voice distorted by the megaphonic effect of a trumpet. Try the experiment yourself, and see. The "spirit rappings" and sounds of "spirit wings" are made by the medium's fingers against the side of a trumpet. The taps which the sitters feel are delivered by the medium with a trumpet. 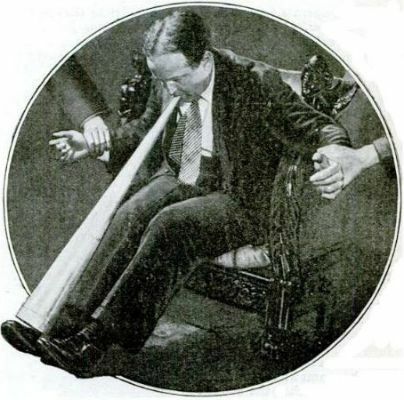 To touch the ceiling with a trumpet or to reach a sitter at the far end of the table, the medium lengthens a trumpet by attaching it to another trumpet by means of the mouth pieces, which are made to fit one inside the other. Some trumpet mediums also produce "spirit voices" in the daylight. The medium holds the large end of the trumpet near his mouth, and whispers into the instrument without moving his facial muscles, while at the same time carrying on a casual conversation with the sitter. You've seen ventriloquist on the stage disguise the fact that they are speaking by much the same method. 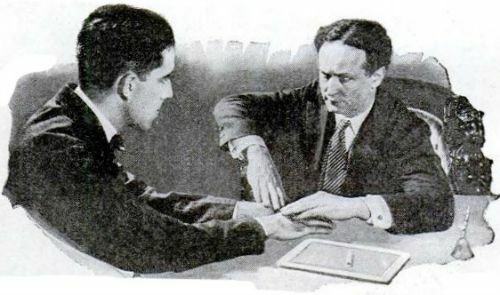 Houdini demonstrates a simple trick by which the fake medium, under cover of darkness, frees one hand to make the "spirits" perform. After stroking the subject's arms and hands a few times with his finger-tips, he deftly removes one hand, placing the other on the backs of the subject's hands in such a way that the change is not noticed. 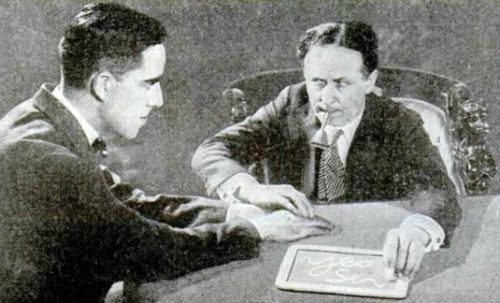 Houdini is seen writing on a slate with his free hand, and ringing a small bell that he has placed in his mouth. For a medium to free himself from a spiritualistic "circle" and so get hold of a trumpet is child's play. In the circle his right wrist is held by the man at his right, while he grips the wrist of the man at his left. By twitching, jerky movements, as if in the throes of sublime ecstacy, he manages in the dark to transfer his grip from left hand to right, freeing his left hand, with which he picks up the trumpet. The "circle" remains unbroken. The particular medium of whom I write performed most of the usual tricks with the trumpets. He also caused a guitar, placed on the table before him along with the trumpets, to be play while he sat with his hands apparent covering those of the persons who sat at his right and his left. He establish communication with the "spirit" of the son of one of the sitters, the "spirit" of an Indian chief, who Spoke pidgin English in a deep bass voice, and the "spirit of a French opera singer, who led us in singing "Nearer, My God, to Thee." I said before, I attended this séance in the hope that the medium might produce something in the way of a genuine spirit manifestation. His methods, though, were so like those of fraud mediums whom I had seen and exposed that I was surprised at having thought him genuine in the beginning, and feared he would turn out to be a trickster. And so, when the opportunity presented itself, I slipped out of the circle in which I sat and smeared lamp-black on the trumpets. I waited until the medium had completed his trumpet work; then I rose, drew and electric flashlamp from my pocket, and directed its rays across the table. It was a startling, though somewhat comical picture that the sudden light disclosed. For there in the circle sat the medium holding the guitar above his head, and his hand and face were as black as a coal heaver's from the lampWack I had used! But an ingenious trick he had freed his hand to manipulate the trumpets and the guitar. "You could feel it if I raised my hand, couldn't you?" he had asked one of the sitters beside him, and, as he spoke, he actually raised his hand and did not put It back, but substituted an Indian relic - a stone - of about the size and weight d his hand, covered by a handkerchief as had been his hand. The sitter, feeling the weight of the stone upon his hand, supposed, naturally enough, that the medium's hand had been replaced after its withdrawal. On this trick rested almost entirely that medium's claim to the possession of psychic powers. Thirty-five years among these vultures has convinced me that they are the most contemptible and the meanest criminals that walk the earth. The confidence man, the burglar, the pickpocket, the highwayman, and others who live by robbing their fellows, must take chances. They meet their victims on even ground and triumph through their wits, their strength, or their courage. The fake medium, though, works with everything in his favor. His victims will believe in him. They are grief stricken by the loss of a loved one, un-nerved and troubled by financial reserves, distracted by the disgrace brought upon them by their wayward children. In their search for consolation, in their troubles, for guidance in their difficulties, they grasp at straws. And the medium adroitly worms their secret out of them, plays upon their fears or their grief, impresses them by elaborate hocus-pocus trumpet work, slate writing, spirit rapping, table-lifting, spirit photographs the like - quickly has in his toils and strips them bare of everything they own. In the sheltering darkness, which makes it impossible for the sitters to observe anything he does, it is not necessary for the medium to be even a clever conjurer. Tricks that in the light would bring him nothing but a laugh of derision, in the darkness are startling and inexplicable. I have caught a medium lifting a table - he claimed, of course, that the spirits did it - by squirming upward in his chair until the edge of the table was caught by a hook attached to his belt, while a confederate raised it a corresponding distance on the other side. Can you imagine a stage magician getting away with anything like that? Or can you imagine a stage magician impressing an audience by having his assistant tap certain persons on the shoulders and run his fingers through their hair? Under cover of darkness, though, and masked by the cloak of religion, such ridiculous trumpery becomes most impressive. I remember in Chicago, quite a few years ago, a medium who had gained a big reputation by doing nothing more remarkable than the last thing I mentioned. This medium was a woman. She insisted upon being firmly held during her séances. Yet as soon as the room was made dark, the sitters felt taps on their shoulders and other parts of their bodies. Fingers were run through their hair. Their watches were snatched from their pockets and thrown to the floor. I attended one of this woman’s séances and I was completely mystified. She seemed to have no accomplices. I knew she had not left her seat during her manifestations, for I myself was holding her. However, my experience and my common sense both told me that her work must be accomplished by some natural means, so the second time I visited her spiritualistic chambers I went prepared. As soon as the light was extinguished I poured e bottle of indelible ink over my hair. In a few moments, as I expected there came a light touch on my head. I moved my head so as to encourage the caresses, and the "spirit" spent quite a little time in pulling my hair and disarranging it. And then, when the light went up, the secret of these mystifying manifestations was plainly disclosed, for the hands of a little old woman who sat in a far corner of the room - by far the most innocent appearing person present - were black with ink! One thing that has impressed me with regard to almost all mediums that I have seen and investigated is their startling lack of originality. The methods that mediums use to impress and mystify dupes today differ in few essential particulars from the methods that were used by the first mediums who sprang up like mushrooms after 1848 the wake of the famous Fox sisters. The Fox sisters, Margaret and Katie, were the founders of spiritualism as we know it today. They were two mischievous children of eight and six respectively, who lived on a farm at Hydesville, N.Y. To frighten their mother they began dropping apples and making other similar noises on the floor of their bedroom while they feigned sleep. Later they learned to produce the sound of rapping by clever manipulation of their fingers and toes, and in a short time the superstitious country folk imputed supernatural powers to them. An older married sister saw commercial possibilities in the odd accomplishments of the children, and exploited them widely. 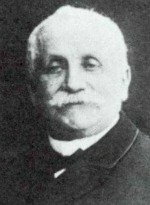 That was the beginning of spiritualism, and, although Margaret Fox made a full confession in 1888, explaining in detail how she and her sister had fooled the public for years, spiritualism has continued to endure and the number of mediums has creased steadily. Another point that I have noted with regard to mediums, a circumstance that should give any thinking person Pause before accepting as genuine the manifestation he witnesses, is that no "spirit" materialized by a medium ever offers anything that is above the mental level of the medium. All spirits, that is, talk in character with the medium. Thus, I have heard an alleged spirit of George Washington speaking with an unmistakable cockney accent. I have heard the "spirit of Shakespeare" make grammatical errors and use modern slang. It was something of that sort that caused me first to doubt the good faith of the average medium. When was about 16, I attended a series of séances given by a medium - a tailor - at Beloit, Wis. At the time I was a confirmed believer in spiritualism. This medium had impressed me greatly by the fact that he habitually put his sitters in touch with the spirits of great men - George Washington, Abraham Lincoln, Napoleon, Columbus - his séances were a constant panorama of history. "Mr Lincoln, what was the first thing you did after your mother was buried?" "I felt very bad," replied the "spirit" glibly. "I went to my room, and I wouldn't speak to any one for days." Now, that reply probably would have been correct in a majority of cases, but it was not correct with regard to Lincoln. For Lincoln's first act when his father had buried his dead mother was to rush off to engage a clergyman to read a burial service over her grave - an act of respect which his father had neglected! And this was certainly not an incident which Lincoln was likely to forget - in the spirit world or elsewhere. "Well, you've caught me; but you'd got to admit that I do more good than harm by consoling sorrowing people who long for a message from their loved ones!" Caught him! I had no intention of catching him! On the contrary, it came as a painful shock to me that one whom I had trusted and believed in completely should so readily confess himself a fraud. When I had asked him about the voices and an odd hissing noise I frequently had heard in the trumpets which he used, I had been innocently seeking information about what I regarded as my religion. However, I was quick-witted enough to take advantage of his unexpected revelation. I permitted him to infer that I had been on to him all along. "But, surely," I asked, "all mediums are not like you? There must be some genuine ones?" "None that I know of," he said with grin. "They're tricksters - every one of them!" And it is with sincere regret that I must report that my 35 years of investigation of mediums in all parts of the world have given me no reason to doubt the statement the tailor-medium made to me then. For years I have offered - with never a successful challenge - as much as $10,000 to any medium who can produce under conditions laid down by me any physical manifestation of his boasted psychic powers that I cannot duplicate by the methods I use as a professional magician. For years I have been duplicating the most mystifying feats of the mediums from the stage - and then explaining to the puzzled audiences exactly how the tricks are accomplished. My success in this work has caused believers in spiritualism to declare that I am a psychic - a medium - without realizing it myself. Such a statement is of course absurd. Every feat that I ever have performed on the stage or off has been accomplished by purely natural means that are explainable by the laws of science and that would be understandable to any one to whom I chose to divulge my secrets. "My friend, for many years I have been forced to sleep with a pillow under my back. That's because a gang of longshoremen crushed one of my kidneys with a chain while tying me up on a stage at Buffalo, N.Y. Why weren't the spirits on hand to help me then?" 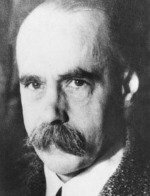 He couldn't answer the question, of course, but I am quite sure if he is still living, he is still a spiritualist, for I have found that the objections one offers even the most unfounded beliefs spiritualists usually have scant effect. Spiritualists will believe - those of them, that is, who are not frauds, for I have encountered only two kinds of spiritualists - tricksters and the deluded persons upon whom they prey. And the latter are not to be shaken even by proofs that the "psychic manifestations" of mediums are accomplished by trickery. Mediums that I have caught red-handed - or black-handed, as the Cleveland medium I told above - invariably have found stalwart defenders among those whom they have been fooling. After I had exposed trumpet medium in New York City a few weeks ago, one of the medium's dupes attempted to attack me physical and only desisted on learning that police were in the room. The spiritualist believers have a stock excuse for a medium who is detected in trickery. "Well, yes," they admit, "you caught him that time - but that was because he had suddenly lost his power. It's only in such cases that he's forced to resort to trickery." For 35 years I have been encountering that kind of logic. It has been a severe test of my patience. Even so noted a man as Sir Arthur Conan Doyle, author and scientist of world-wide reputation, creator of Sherlock Holmes, probably the most coldly, rigidly logical character in English fiction, many times has used much the same sort of specious reasoning when I have challenged the basis for his faith in spiritualism. He is one who firmly insists that my stage tricks are performed with the aid of spirits; that I am a psychic. Once he went so far as to ask if I was "the last word in religion and science in America." "Well, Sir Arthur," I replied "not exactly that. But, if you were to build a packing-case large enough to contain me and all the American spiritualists and the scientists the uphold them, weight it with pig iron, tie us up in it and throw it into the sea, I'd be the only one that would come up. But it would be trickery that would release me," I added. "He must be genuine. Why, the spirits that talked in his place told me things that nobody but myself knew." Early last summer Police Commissioner Enright, of New York, asked me to lecture at the New York Police Academy, to explain to the members of the police force just how to go about detecting fraudulent mediums. The best and most direct way that occurred to me of doing this was by staging a séance, performing myself the tricks that the mediums use. "Is Lieutenant Smith of the Eighteenth Precinct here?" Much mystified, the lieutenant acknowledged his presence. "I," said the "spirit," talking through me, of course, "am the spirit of John Brown, whom you saved from drowning at the foot of East Ninety-First Street in 1920. I want to thank you for that and congratulate you on your promotion. There'll be another promotion coming to you soon. Tell your boy Joe not to worry about his examinations; he's going to pass. And tell your wife not to worry about the baby. The little girl will get through the hot weather all right." Lieutenant Smith had never spoken to me in his life, nor I to him, so naturally he was thunderstruck when the "spirit" singled him out from the big crowd of policemen present to tell him all this. No doubt you, too, would be similarly astounded were I - or a medium - to tell you something similar under similar conditions. And yet there is nothing astounding about it. I was able to call that lieutenant by name because I had learned his name from one of his brother officers. I was able to tell him about the rescue because the same officer had told me about it. My informant also told me the Lieutenant Smith had been promoted recently, that he was married, and the he had a boy of 12 and an infant daughter. Inasmuch as the schools were schedule to close for the summer in a couple of weeks, it was easy for me to guess that Joe was worried about passing his examinations. And since summer we coming on, I was quite safe in assuming that Mrs. Smith, like every other mother I've ever met, would be concerned about how her baby was going to stand the hot weather. Simple, isn't it? Yet how mystifying when you're not in on the secret! A favorite dodge of the mediums, that one! Almost invariably they work it on newcomers to their séances. Sometimes the surprising personal details related by the "spirit" are supplied by the spiritualist friend who has introduced the visitor, for spiritualists like to make coverts, and if they can do so by helping the medium in his trickery, they'll do it. Give a clever medium a man's name, address, and occupation - information that can be obtained from the city directory - and with the aid of a few leading questions and a little deduction, the medium can convince that man that he knows the innermost secrets of his soul.I do this sort of thing from the stage regularly as part of my work of exposing the tricks of fraudulent mediums. One of my most useful pieces of equipment in this connection is a library of city directories of the leading cities of the United States. With their aid I am able to tell persons in the audience most astounding things. Thus, while playing in New York recently, my assistant, whom I had stationed in the lobby for the purpose, related to me a brief exchange of conversation between two men, overheard while they were passing through the lobby of the theater. "Pretty good," replied the other; "we've sold a lot of cars this year." With this much to guide me, it required only a moment to ascertain from the St. Louis city directory the full name and address of a Mr. Blank - the name I use is fictitious - who was in the auto mobile business in that city. Later from the stage I called Mr. Blank by name told him his business, made the obvious guess that it was business that had called him to New York, gave him the assurance of the "spirits" that his business trip would be successful, and otherwise astonished him and the audience by my supposedly spirit-given knowledge of his personal affairs. At another performance in the same theater I absolutely flabbergasted a man in the audience by calling him by name, and informing him that he had come to the theater to escape from a quarrel he was having with his wife. I knew this because I myself had observed the couple quarreling on the side walk before the performance began, had heard the wife call the man by name, and had seen him rush into the theater and buy a ticket. On account of the prominence of the persons named, a demonstration of this sort of mediumistic trickery which I gave in a Boston theater not long ago cause quite a stir. "Is John Lewis Bates in the audience?" I asked from the stage, naming a former governor of Massachusetts. Governor Bates acknowledged his presence. "The spirit of the late Governor Curtis Guild is here," I announced. "Probably you don't believe this, but I'd like to convince you. The spirit wants to know why you cut off the side whiskers you used to wear. You used to wear side whiskers, didn't you?" "Many years ago," replied the ex governor. "The spirit also wished to know if you recall having dined with him at the Algonquin club in Boston when he was governor about 20 years ago." "I recall it very well," was the response "He wants to know if you recall the subject discussed. It was Jesse Pomeroy, wasn't it?" I asked. "Yes," replied Mr. Bates, thoroughly astonished, while the audience gasped in amazement. "But how did you know?" The explanation is almost unbelievably simple. I knew, of course, that former Governor Bates was in the audience. I also knew that he had formerly worn side whiskers, for I had seen him wearing them on another visit to Boston about 25 years ago. Also, former Governor Curtis Guild, journalist and soldier, was my personal friend. I had been his guest at to Algonquin Club in Boston. He had told me that it had been a customary procedure to present a petition for the pardon of Jesse Pomeroy, the famous boy murderer, to each successive governor of the state. Knowing all this, it was easy for me to piece together the tale I unfolded to him from the stage that night. A few facts, and a little artful guessing - that is all the material a clever medium requires to mystify the average person.